Sunday August 28 1910 It was late when we got up. I wrote a little before Browns sent for us. We drove out down the road past Uncle Jacobs old home. Spent a very pleasant day. Mr & Mrs Brown brought us in just at dark. Our last night on the porch What pleasant week. I did part of the packing. 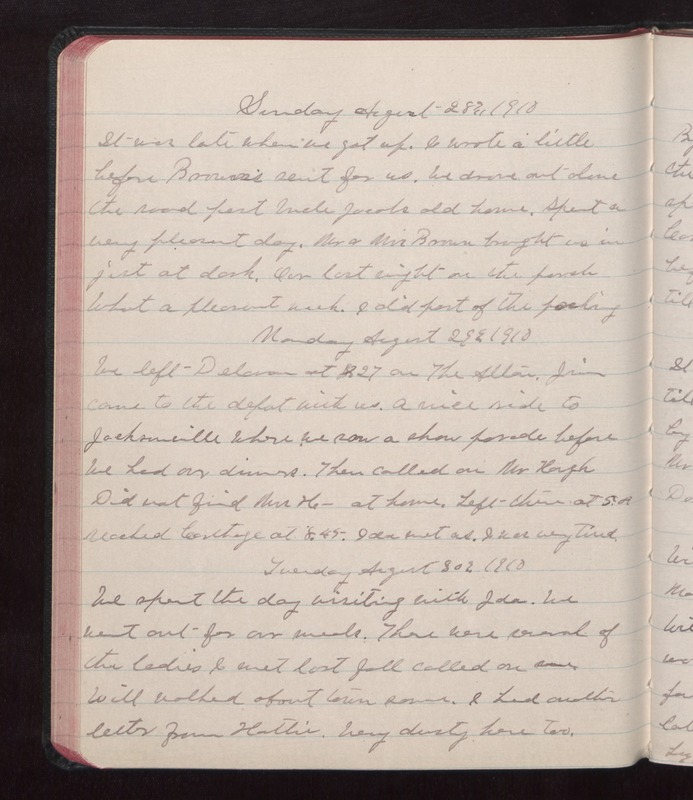 Monday August 29 1910 We left [Delamar?] at [3.27?] on The [Allain?]. Jim came to the depot with us. A nice ride to Jacksonville where we saw a show [parade?] before we had our dinners. Then called on Mr. [Hough?] Did not find Mr H-- at home. Left there at 5.09 reached Carthage at 8.45. Ida met us. I was very tired. Tuesday August 30 1910 We spent the day visiting with Ida. We went out for our meals. There were several of the ladies I met last fall called on me Will walked about town some. I had another letter from Hattie. Very dusty here too.